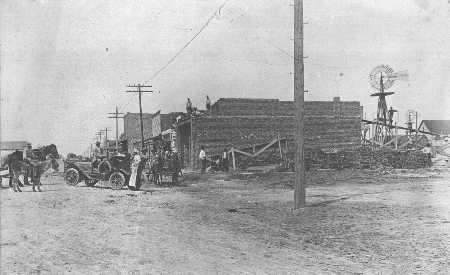 Scene on Grant Street, 1906. What variety has been captured in this picture of the east side of Grant Street between First and Second streets. You don't very often get a chance to see mules, horses, automobiles, windmills, electric poles, chefs and brick layers all together. Note the man on the ramp close to the windmill on the right side of the photograph. Courtesy, Barrett & Oliver; Odessa, City of Dreams. Photograph: Ector County Library SouthWest History.